MIT researchers have found a way to boost lithium-air battery performance, with the help of modified viruses. Lithium-air batteries have become a hot research area in recent years: They hold the promise of drastically increasing power per battery weight, which could lead, for example, to electric cars with a much greater driving range. But bringing that promise to reality has faced a number of challenges, including the need to develop better, more durable materials for the batteries’ electrodes and improving the number of charging-discharging cycles the batteries can withstand. Now, MIT researchers have found that adding genetically modified viruses to the production of nanowires — wires that are about the width of a red blood cell, and which can serve as one of a battery’s electrodes — could help solve some of these problems. The new work is described in a paper published in the journal Nature Communications, co-authored by graduate student Dahyun Oh, professors Angela Belcher and Yang Shao-Horn, and three others. The key to their work was to increase the surface area of the wire, thus increasing the area where electrochemical activity takes place during charging or discharging of the battery. The researchers produced an array of nanowires, each about 80 nanometers across, using a genetically modified virus called M13, which can capture molecules of metals from water and bind them into structural shapes. In this case, wires of manganese oxide — a “favorite material” for a lithium-air battery’s cathode, Belcher says — were actually made by the viruses. 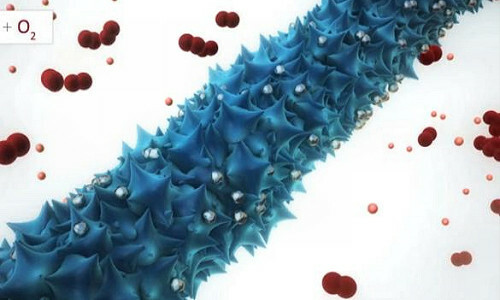 But unlike wires “grown” through conventional chemical methods, these virus-built nanowires have a rough, spiky surface, which dramatically increases their surface area. Belcher, the W.M. Keck Professor of Energy and an affiliate of MIT’s Koch Institute for Integrative Cancer Research, explains that this process of biosynthesis is “really similar to how an abalone grows its shell” — in that case, by collecting calcium from seawater and depositing it into a solid, linked structure. The increase in surface area produced by this method can provide “a big advantage,” Belcher says, in lithium-air batteries’ rate of charging and discharging. But the process also has other potential advantages, she says: Unlike conventional fabrication methods, which involve energy-intensive high temperatures and hazardous chemicals, this process can be carried out at room temperature using a water-based process. Also, rather than isolated wires, the viruses naturally produce a three-dimensional structure of cross-linked wires, which provides greater stability for an electrode. A final part of the process is the addition of a small amount of a metal, such as palladium, which greatly increases the electrical conductivity of the nanowires and allows them to catalyze reactions that take place during charging and discharging. Other groups have tried to produce such batteries using pure or highly concentrated metals as the electrodes, but this new process drastically lowers how much of the expensive material is needed. Altogether, these modifications have the potential to produce a battery that could provide two to three times greater energy density — the amount of energy that can be stored for a given weight — than today’s best lithium-ion batteries, a closely related technology that is today’s top contender, the researchers say. Belcher emphasizes that this is early-stage research, and much more work is needed to produce a lithium-air battery that’s viable for commercial production. This work only looked at the production of one component, the cathode; other essential parts, including the electrolyte — the ion conductor that lithium ions traverse from one of the battery’s electrodes to the other — require further research to find reliable, durable materials. Also, while this material was successfully tested through 50 cycles of charging and discharging, for practical use a battery must be capable of withstanding thousands of these cycles. While these experiments used viruses for the molecular assembly, Belcher says that once the best materials for such batteries are found and tested, actual manufacturing might be done in a different way. This has happened with past materials developed in her lab, she says: The chemistry was initially developed using biological methods, but then alternative means that were more easily scalable for industrial-scale production were substituted in the actual manufacturing. In addition to Oh, Belcher, and Shao-Horn, the work was carried out by MIT research scientists Jifa Qi and Yong Zhang and postdoc Yi-Chun Lu. The work was supported by the U.S. Army Research Office and the National Science Foundation. The above story is based on materials provided by Massachusetts Institute of Technology. The original article was written by David L. Chandler.